Snippets of Jack: "Every Route, Every Destination"
As we already know, Jack Sparrow escape custody in the middle King George's palace. Gibbs, however, was not so lucky. Rather, he is stuck with his life sentence given to him by Jack, disguised as Judge Smith. 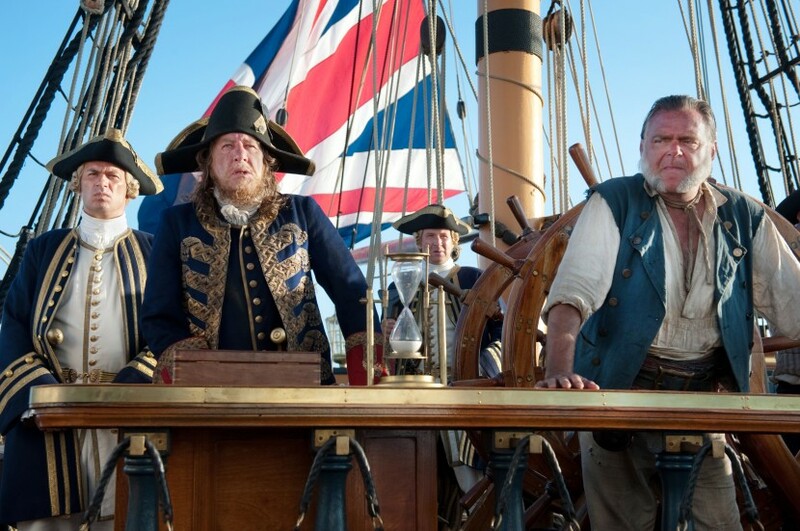 Barbossa, the new privateer for the Royal Navy, has different plans for Gibbs' fate. Barbossa drags Gibbs out to the gallows in the middle of the night. Gibbs: "There's been a mistake. It's a life sentence, not death. LIFE! Barbossa!" Barbossa: "Thank you, gentlemen. I trust you can tie a noose." Gibbs: "That's a hard thing, forcing a man to twist his own hanging rope." Barbossa: "You must lie in your bed the way you made it." You make about as much sense as Cutler Beckett when he talks about material. Do British Navy people not know how to talk??? Gibbs: "What happened to you?" Barbossa: "Where be Jack Sparrow?" The question we would all like to know. Gibbs: "He escaped." As usual. Barbossa: "I'm on a tight schedule Gibbs. The HMS Providence sets sail at first light. If you do not care to watch it hanging here dead, with a mouth full of flies . . . speak now." Ew. Too many bad images are popping into my head. Gibbs become slightly frantic now, watching them prepare the noose. Gibbs: "Take me wtih you. Any point of the compass. . ." Barbossa: "Take you were Gibbs? The Fountain? Aye? Is that where Jack be headed? Have you anything you can offer me, Gibbs? Anything at all?" Um, so many questions. Gibbs remains silent and terrified. Barbossa: "Upon me naked word, you'll not see the dawn." More noose tying, and Gibbs becomes desparate. But he's still a smart man, after hanging out with Jack for so long. He pulls out Jack's maps to the fountain of youth. Barbossa is intrigued. Barbossa: "Hand it over." Gibbs pretends to hand it to Barbossa, but instead lights it on fire. Hah aha, tricked you! Which is a shame because those maps were so valuable. Barbossa: "You fool!" Gibbs: "I had just enough time to study those infernal circles. Every route, every destination. All safe. . . in here." Barbossa, furious, scowls: "Welcome back to His Majesty's Navy, Master Gibbs." How does Barbossa know that Gibbs used to be in the Navy? Remember the opening scene of the saga? Those charts keep Gibbs alive alive while on board the HMS Providence, while the British and the Spaniards race to The Fountain of Youth. Barbossa: "Be we on the right course, Gibbs?" Gibbs: "Aye, it be proper. There's your proof!" He points at a fleet of Spanish ships sailing in the same direction. Barbossa looks where Gibbs pointed through a spyglass and apparently does not like what he sees. Barbossa: "The Spaniard! All hands! Battle stations! Get to windward!" The crew then prepares to fight the the Spanish fleet but apparently they have better things to do then blow up some Brits. Gibbs: "He never so much as turned his head." How Gibbs can see from that far away I have no idea. Barbossa: "The fountain is the prize. It appears we be not even worth the time it would take to sink us. And now we've fallen behind! All hands make more sail!" Let me get this straight. You can either fight three huge ships or you can get ready to fight them but fall behind. That seems rather grim any way you slice it.